I don’t consider myself one of those “off-the-deep-end knuckleheads”, and I’m stopping short of calling for his resignation, but Mike Matheny isn’t impressing me. Commands the respect of his players? I believe he does, yes. Good at managing people? Perhaps. Defending his players? To a fault. Interaction with media? (Remember how tremendously important this has been for the better part of the last 20 years?) So-so. I’ve always said that I don’t care what he does, or how he does it, I want my manager to get wins. I want those wins to translate into playoff appearances, and I want more wins there, that lead to championship flags flying over the out-of-town scoreboard in right field. I don’t care if he’s terse with members of the media in postgame interviews. I don’t care if he changes pitchers 7 times in the 8th inning. I don’t care if he lets certain players call their own hit-and-run, or bunt play, or if he double-switches late in the game for defensive purposes, even if it puts the pitcher’s spot in the order in the 4 or 5 hole. As long as it works when it counts (understanding that it’s a game of failures), and leads to, you guessed it, wins. A decision by the manager will lead DIRECTLY to some wins & losses, the total of which may reach as many as 12. That last point has an awful lot of “art” & “open to interpretation” embedded in it. If the manager pulls Gast for Boggs in the 9th, and Boggs promptly gives up a walkoff bomb to the next batter, you could argue both sides: Player’s fault vs. Manager’s fault. If Boggs replaces a pitcher after having blown 6 or 7 straight saves, the argument for “player’s fault” becomes increasingly difficult to argue. I just thought that was worth pointing out, given the statement about double-switching the pitcher into the heart of the order. Here’s where it might seem like I’m crazy, and contradicting myself, but stay with me. Yes, it turned out ok last night, that whole double-switching thing I mentioned a minute ago, but that spot in the order came up a couple of times in extras. And, as some suggested, the opportunity to pinch-hit Westbrook with the bases loaded in the 13th, was there since, after watching strike three, Seth Maness didn’t return to the mound to pitch the 14th. I’m not saying I do or don’t agree with that idea, just pointing it out. My point is that the pitcher’s spot came up more than once in extra innings, and while it wasn’t ideal, there were few other options at the time, and we eventually won. But it wasn’t a situation where the Cardinals won because of the move, so much as they won in spite of it. I had an exchange on twitter last night when a fan compared it to the 20-inning game against the Mets a couple years ago. While there are similarities, I hardly see it as the same situation. You can’t convince me that, no matter how many other things are similar, that a 14-inning game and a 20-inning game are basically the same thing. Those are six huge innings. I’m a big LaRussa fan. I’m a big LaRussa fan mostly because there are two flags flying over that scoreboard in right field than weren’t flying when he got here. I am trying not to compare Matheny to the soon-to-be Hall of Fame manager we’ve had here in St. Louis for so many years. It’s not fair to do that–it’s like comparing the girl you’re dating now to the one you were dating for the past 3 years–these are different people with different styles and personalities, different theories and philosophies, and accepting that is imperative. Sometimes I need to remind myself that Matheny took this club right up to the brink of back-to-back World Series appearances and not be so down on him. But, man, when I see certain things, it’s just really frustrating as a fan who wants this team to succeed. And then the way that a lot of those types of discussions end. His next sentence started with, “Still…”, and you can probably imagine the rest. I believe that those guys in the dugout, making those decisions, are paid a lot of money to do what they do, and that they have way more information at their disposal to make good decisions than I can pull up at a moment’s notice in my little iPhone from the stands. For that reason, even when I don’t like it, I trust that they must know something I don’t. Though I’ve been throwing it out there since April, I don’t get too worked up over “Mathenius” moves. Similarly, when twitter explodes with “Because Matheny”, I don’t overvalue what I’m reading. Some of the points are valid, of course, but given that it’s a fanbase with a voice, you simply can’t please all of the people all of the time. And, as I said earlier, I don’t care about that stuff–just win, baby. Because, in the grand scheme of things, whether you’re doing the right thing or not, we all know what haters are gon’ do. But there are some things that are not hidden. Some things, all of us know or can see, or are able to discern. For example, last week when Miller took a line shot off the arm on his second pitch of the game. Blazek came in to replace the injured Miller, and pitched for one inning before the next day’s starter, Westbrook, came in to pitch 4+ innings of relief. Choate, Butler, and Rob Johnson would follow to close out the game, with the Cards on the wrong end of a 13-4 beatdown. I, like you, have heard arguments for and against what happened there. Those reasons aside (and a very good case was made by my friend Bob, who I hold in very high respect), I just can’t get past the thought of burning the next day’s starter in the 2nd inning of today’s game. The trickle-down issues caused by that single decision affect this team for a couple of days. Calling guys up from AAA, sending guys down, shuffling the rotation, figuring out the “what now”s and “who is available” factors in the bullpen for a couple of days…it just seemed counter intuitive, and to have hurt the club more than it helped. If you’re going to lose a game, fine, the Dodgers are red hot right now, and a Cards sweep was unlikely. Take the loss, and come out swinging tomorrow. Don’t finish using every available arm, including one you’ve been saving for tomorrow’s game, bring him in on short rest (week-wise AND minute/warmup-wise), and use all your bullets in a losing cause tonight, leaving yourself only a knife to bring to tomorrow’s gunfight. That’s not a situation where I just don’t have access to the info that Matheny does. You feel me on that? You might not, and that’s ok.
I’ll stop there, but you get the idea, right? I’m sure there’s a reason, but to me, it’s not more of the “information I don’t have access to” variety. I can see, rather plainly in fact, that it was a week between starts for Wainwright, and that the rotation was set to start that uber-important 5-game series in Pittsburgh by throwing Jake Westbrook in game one, and “saving” (?) Wainwright for the 4th game of that series. I don’t know. I mean, I get that Wainwright hasn’t been himself lately, but he was himself up until that point. In fact, he was so himself that earlier in the month, he decided he wanted to pitch for the Cardinals on Sunday, rather than pitch for the National League All-Star team on Tuesday. Maybe there’s something I’m missing here, but to me, if you have an ace, you want him to start as many games as possible, you want him throwing on regular rest, and in big games like division opponents who happen to be the only thing separating your team from first place heading into August. He faced the Bucs last night (obviously), and I believe would face them at PNC on Saturday, Aug 31st and again here at Busch on Sunday, Sept 8th. At least he won’t miss them completely, if my count is right. 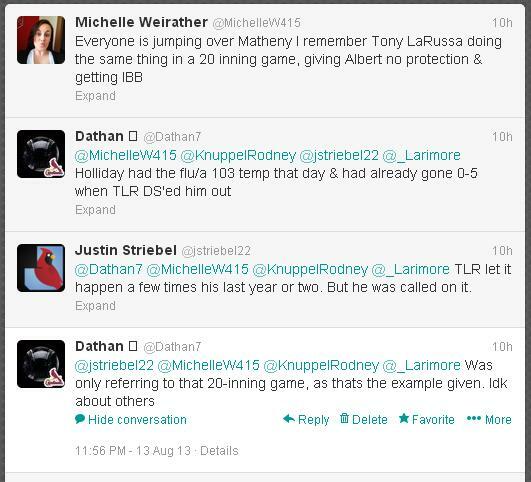 But, Matheny has taken a start from him, in that, the regular season ends on Sunday, September 29th. Wainwright’s regular day to pitch would be the 30th. So, if there’s a game 163, he’d presumably start it. If the Cardinals are in the one-game playoff play-in thing (hoping to avoid that), I guess he’d go then. If the Cards are in the NLDS, the assumption is that he’d go in game one on extra rest. Hopefully it doesn’t come down to it, but not having him for that one additional regular season game could prove costly…and I’m not sure why things are set up that way. All in all, I’m not getting too worked up over it right now. At the end of the season, I don’t care how we got there, or how ugly it seemed along the way, as long as the end result is there–that’s what I care about more than anything else. If not, I, like most of you, will be disappointed and unhappy. Will the Cardinals front office? I guess we’ll see if they offer Matheny an extension.